Budleigh Salterton remains one of Devon’s most unspoilt and charming towns, containing many interesting shops and other attractions for visitors who want to spend a delightful holiday in the town, or who wish to enjoy a day in the friendly and relaxed atmosphere which so typifies this tranquil and historic retreat from the stress of everyday living. In Budleigh Salterton you will also find a stunning beach and coastline together with countryside, public gardens, golf courses, adventure parks and caravan sites. 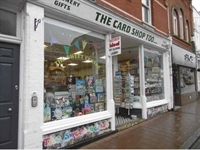 There is convenient free short time parking opposite the shop and good bus and arterial road links to all parts of Devon and beyond. The business has been successfully owner operated for many years with part time assistance during busy periods. 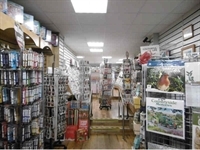 It also has a wide range of merchandising with a dry cleaning pick-up service and confectionary but this overall trade could be expanded greatly especially with such large premises and it’s widely considered to be the hub of the town. Actual trading accounts will be made available following a successful formal viewing. This area is situated immediately to the front and benefits from large display windows making it bright and airy. With a bespoke counter and servery area together with retailing for stationary, confectionery, children’s toys, seasonal items, maps, key rings, fridge magnets, knitting corner with wool display and many wire carousels for various products. 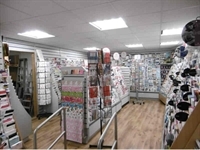 This area is situated to the rear and retails a comprehensive range of cards both occasional, celebration and seasonal which, uses both wall shelving, island display to all four sides and an array of wire carousels. A large open plan area which could easily be in cooperated to provide further retailing space but currently is used for general storage of stock and also with a larger rail for dry cleaning pick-up. This is an ideal area for a kitchenette / staff area but also has some storage space too because of its size.